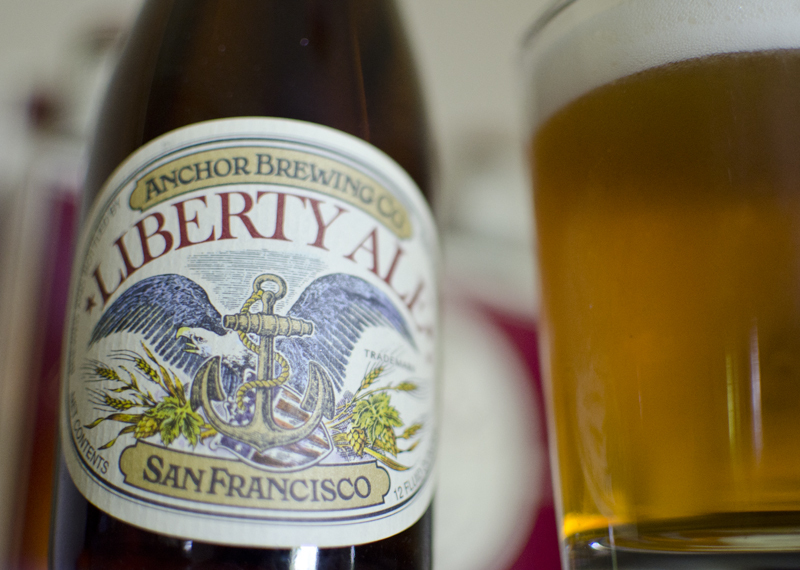 First bottled in 1975, Anchor Liberty Ale may today seem mild to many consumers used to much bitterer, and stronger, ales. Photo by Jon Page. On June 26, 1975, Anchor Brewing Co. in San Francisco bottled 530 cases of what its owner, Fritz Maytag, called Liberty Ale. It had been released in draft in April to mark the 200th anniversary of Paul Revere’s ride through Greater Boston. Ironically enough, given its commemoration of the start of the American Revolution, complete with a screaming eagle on the label above a shield of the old red, white and blue, Liberty Ale drew its inspiration from a British beer. Maytag and Gordon MacDermott, Anchor’s general manager, had traveled to England to check out styles perhaps worth imitating back in the U.S. They found one in Landlord, an ale from the Timothy Taylor brewery in West Yorkshire. Garrett Oliver, Brooklyn Brewery’s brewmaster, has described Landlord as “a bitter with a color of pale honey and a wonderful aroma of hay, earthy with deliciously bready grain flavors lingering in the aftertaste.” A fruitiness born of a “very full-flavored hop presence” distinguished Landlord, according to Oliver. It was a hop presence that would distinguish Liberty Ale as well—one hop in particular. While Coors used a relatively small amount of Cascade, Anchor went long, crafting a beer several times more bitter than most of the domestically made beers available in the U.S. then. Liberty Ale, for instance, was about four times as bitter as Miller Lite, which had also been introduced in 1975. Today, of course, Liberty Ale might seem mild to many consumers used to much bitterer, and stronger, ales. Those hopped-up India pale ales, however, unknowingly or not, took their stylistic cues from that pioneering Anchor Liberty Ale first bottled exactly 39 years ago. Read about Anchor’s first beer labeled as an IPA. As for that first bottling run, sales were modest. America wasn’t quite ready yet for a beer so bitter, no matter how refreshing. (Miller Lite’s sales, on the other hand, ballooned and then ballooned some more.) Anchor renamed Liberty Ale “Our Special Ale” (indeed). It did not re-emerge as Liberty Ale until the summer of 1983. That bottling run was nearly 3,000 cases.